$1,200 Adults. $1,050 Children 12 and under. The participation fee covers local housing during the project, three vegetarian meals a day, ground transportation to and from the airport and project site, local excursions, short-term travel insurance, a Maranatha t-shirt, and luggage tags. Children 12 and under have a discount of $150. Flights, passports, entrance visas, and vaccinations are not included in the participation fee. There is an optional excursion to Victoria Falls available after the project for an additional cost of $670 per person. All prices are listed in US dollars. Maranatha offers at least two family projects each year that provide service opportunities for every member of your family, both young and old. This year, join Maranatha in the country of Zambia! Volunteers will be working at the Kabwe Adventist Primary School, about two hours northeast of Lusaka. The school currently has more than 500 students from Pre-K to Secondary, 350 of those students are in the primary school. They currently meet in a very small, crowded facility in the heart of the city. The school is well-run, but they are severely limited by space. To solve some of the problems, the school will move the primary portion of the school to a new location on the outer edge of the town on a piece of property with the new conference office. Maranatha volunteers will be assisting with the masonry construction of the new 12-classroom school campus. In addition to the construction, there will also be outreach programs such as children’s ministry programs. And if we have medical professionals with us, we would like to provide medical outreach as well. Younger volunteers will have a chance to join the Day Camp during the project to experience different aspects of service and receive insights into daily life in Zambia! While this project is geared towards families and preference is given to family groups, individuals are also welcome on this project. This project will include a day-trip safari excursion and volunteers can also choose to extend their stay after the volunteer project in order to join an optional excursion to the world-famous Victoria Falls for an additional cost. 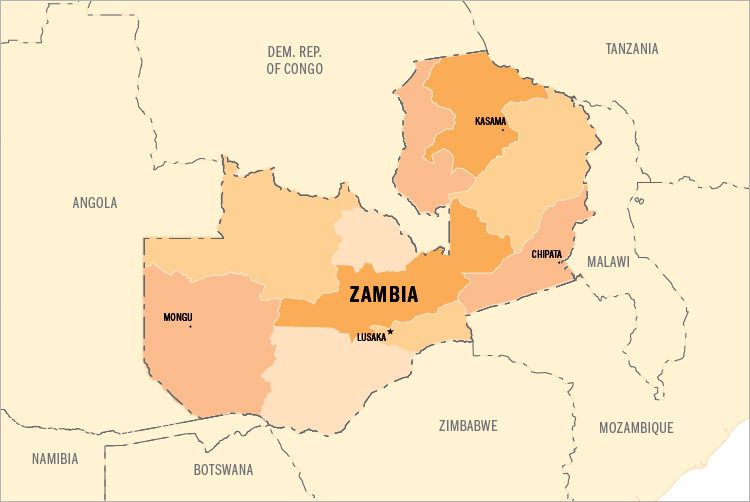 ARRIVALVolunteers will arrive in Lusaka, Zambia (LUN) between 9:00 a.m. and 3:30 p.m. on Thursday, June 20.Please wait for confirmation from Maranatha before purchasing your airfare to ensure there is still space on the project. DEPARTUREVolunteers will depart from Lusaka, Zambia (LUN) on in the evening of Sunday, June, 30, after 6:00 p.m. or continue on the optional excursion. Those on the optional excursion will depart from Victoria Falls, Zimbabwe (VFA) on Wednesday, July 3. Volunteers will purchase their own plane tickets for the project. The dates posted are the arrival and departure dates from the project, but due to travel time, you may need to leave a day or two before the arrival date. Maranatha representatives will meet volunteers upon arrival at the final destination. More information about the flight details for the project are available in an information packet available for download above. Booking outside these windows could result in additional fees and missed portions of the project. On the final Sunday volunteers will travel back to Lusaka and visit Chaminuka Game Reserve, a small park with 72 species of mammals, reptiles, and amphibians; plus 300 species of birds. The group will take an afternoon safari, enjoy a nice buffet lunch, and take a boat ride on a nearby lake before heading to the airport Lusaka for departing flights or spending the night near the airport to catch flights the next day. Since the animals are wild, there is no guarantee of what the group will see. The Chaminuka excursion is included in the participation fee. For an additional $25, you can add a 30-minute cheetah interaction at the park where you are guaranteed to see cheetahs and can even pet one (they are in a large, caged area and are put on leashes with trained personnel). If volunteers choose to have a little more lengthy excursion in Zambia, they can choose to join an optional excursion to Victoria Falls and Chobe National park for an additional cost. Those joining the optional excursion will skip the Chaminuka excursion because they will be driving that day to Victoria Falls. But the optional excursion fee already includes a discount for cost of the Chaminuka excursion that you will not participate in. On Sunday, volunteers will head south (about 9 hours) to Livingstone, Zambia where they will spend the night. On Monday, the group will see Victoria Falls from the Zambia side before crossing into Zimbabwe to see the falls from the other side. Victoria Falls is one of the seven Wonders of the World, and it is truly a magnificent sight. Upon arrival in Victoria Falls, you will hear the thundering of the water and see the mist that rises more than 1,600 feet into the air. The falls are more than a mile wide, and nearly 150 million gallons of water cascade down the drop off each minute during the peak of the Zambezi River’s high water flow. That evening, volunteers will will enjoy a sunset river cruise on the Zambezi River. The following morning the group will cross into Botswana and enjoy a full-day safari in Chobe National Park, a nature reserve that has one of the largest concentrations of animals in Africa. Volunteers will get a chance to see all kinds of animals including elephants, hippos, giraffes, zebras, lions, cheetahs, and much more. On Wednesday, volunteers will have the morning free to explore the town or relax at the hotel before departing for home from Victoria Falls, Zimbabwe.